What are the firm beliefs about life or love that you hold dear? Will you fight for or even suffer for these beliefs just to defend them? What are the certainties that form the firm foundation of your life? One of the very foundations of our beliefs as Christians is that we are loved by God. God who is love loves us completely and without measure. This love is best exemplified by Christ himself and his unselfish gift of his life so that we, too, might live. Have you given some thought about this foundational belief of our Christian faith? We wish to invite you to contemplate about Jesus on the cross. Spend some time recounting what the Lord has done for us because of love. Recall what Christ has done for you. Speak to God and tell him how you are moved by his display of selfless love. If it helps, you may view the video by Ingrid Napitupulu using the song "He Loved Me" by Tom Fettke and Doug Holck. This song is based on Romans 8:35-39. 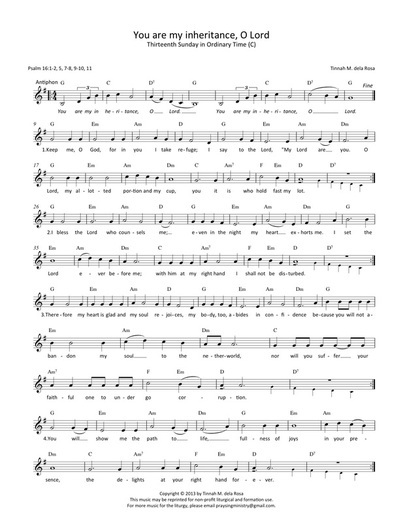 Below are the lyrics of the song. May your prayer today lead closer to God who chose you and loves you. May nothing separate you from the love of God. May your Thursday be love-filled! Who shall separate me from the love of God? Can the need of food or earthly possessions? The threat of war or men's oppression? 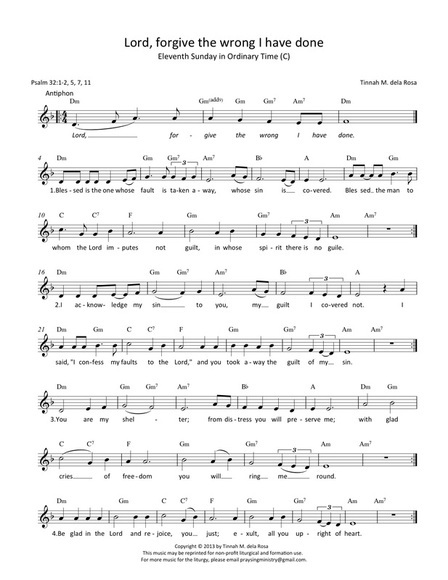 Our featured PraySing material today is an excerpt of the song "Blessed Are You, Lord God" one of the tracks from the Gaudium Mass composed and arranged by Tinnah dela Rosa. After the gifts of bread and wine have been brought to the priest or deacon, the blessing of the gifts follows. This blessing is an important reminder that all comes from God, but we cultivate what we have received and produced - the bread and wine in our own lives - which we also offer to God in the desire to have them transformed. Oftentimes musicians sing an Offertory Procession Song even during the preparation and blessing of the gifts by the priest at the altar. While "singing may always accompany the rite at the offertory, even when there is no procession with the gifts," (GIRM, 74) liturgical musicians must note that the song selected must keep the congregation's focus on the actions taking place at the altar. Thus, it is ideal to select a song that supports the liturgical action during this part of the mass. 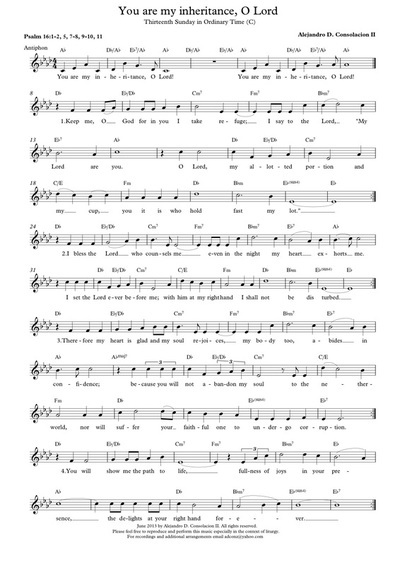 This song is best sung by the priest and responded to by the congregation and choir during the preparation of the gifts because the dialogue leads the congregation to become more aware of how the gifts offered are from God and to help them respond affirmatively and with joy to the goodness of our God. Even when the part of the priest is not sung, the conclusion to the prayer which is, "Blessed be God, forever" may be sung as the response of the people. The full song and SATB score is found in the Gaudium Mass CD and songbook which may be purchased at these distribution centers. Click here to view the readings for next Sunday (June 30, 2013) via the US Conference for Catholic Bishops website. R. (cf. 5a) You are my inheritance, O Lord. How many times have you felt so alone and downtrodden? How do you respond to such situations? Do you give in or hold on? We all have our share of dark moments where despair creeps in and takes over. However, such experiences may also be opportunities for us to find hope and strength that we thought we never had. When we look into our heart of hearts, there’s a love that never tires, a hand that never fails to extend care and support and a promise that is always fulfilled. The song, “He Will Carry Me” by Mark Schultz, reminds us of the Source of such love, care and promise — our ever faithful and loving God. As you pray with this song, ask the Lord for the grace of hope and trust as you recall your experiences of darkness and light. Let Him carry you out of the storm, and bring you understanding, love and healing that you long for and need. May the Lord carry you to greater things this Thursday! Our Tuesday PraySing material is the Preface Dialogue from the Gaudium Mass by Tinnah dela Rosa. The new translation of the Roman Missal uses "it is right and just" to replace "it is right to give Him thanks and praise." The addition of "just" more closely aligns with the Latin original, but more importantly reminds us that as the people who bind ourselves to God, we are correct to give thanks to God who provides all things for us and it is we who are made righteous and share in the righteousness of God. This new wording guides us in deepening our commitment to God and becoming better embodiments of His goodness and love in our world. For more information on the Gaudium Mass CD and songbook, please visit this link. Click here to view the readings for next Sunday (June 23, 2013) via the US Conference for Catholic Bishops website. Where do you go when storm clouds come your way or when the waters rise? Whom do you run to when you are seeking safe shelter? As rainy season begins once more, we find ourselves seeking momentary shelter when it begins to pour. During really strong typhoons some of us even flee our homes when flood waters rise. We know the drill when it comes to physical storms and floods. But how about when they are emotional, psychological, financial, or spiritual storms and floods? Where do you find a safe hiding place? As you pray with the song "Hiding Place" by Steven Curtis Chapman and Jerry Salley, recall these times of turbulence in your life. Did you find yourself running to the Lord for shelter? Did you allow the Lord to keep you safe amidst the storm? Ask the Lord to give you the grace and humility to run to him for shelter. Pray that you may also learn to seek the Lord during the sunshine as well as during the rain. The Lord is, after all, our one true hiding place. May blessings pour your way this Thursday! God bless us all! Video courtesy of Lea Jones. Our PraySing Ministry material today is the instructional video 'We proclaim your Death." This is one of the three memorial acclamations for the New Roman Missal written by Tinnah dela Rosa in the Gaudium Mass. This setting is intended to be sung by the people and not simply the choir. In fact, the capabilities and vocal range of the congregation were considered in composing the music to enhance their ability and desire to participate in singing their praises to God. Choir and piano parts only exist to complement the people’s melodic line. 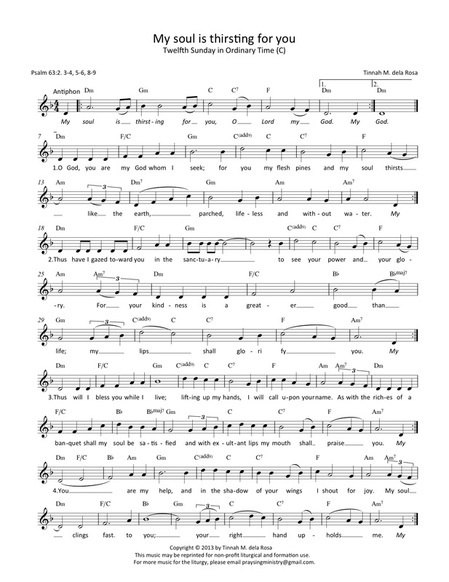 Furthermore, this melodic motif also appears in the other two Memorial Acclamations of the Gaudium Mass, making all the three versions easy to recall by the congregation as they try to learn the new text of the mass. 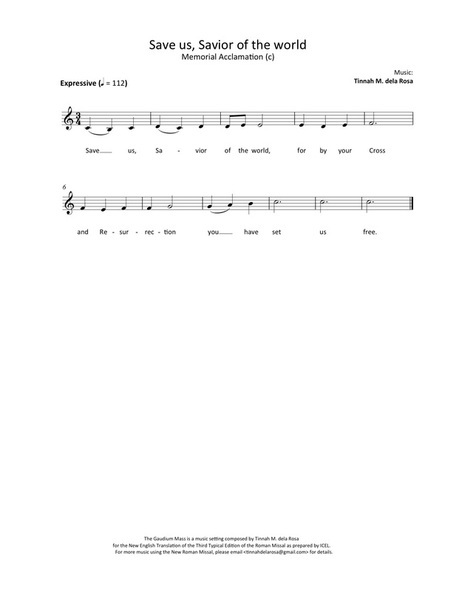 You may download the PDF file with the simple melody here. Click here to view the readings for next Sunday (June 16, 2013) via the US Conference for Catholic Bishops website. Have you ever been in a relationship that seemed promising but did not last? There are many reasons why some relationships come to an end. Though there may be uncertainties in our human relationships there is one relationship we can always count on. It is our relationship with the Lord. Our one sure certainty as Christians is that the Lord's love for us is steadfast and without end. As you pray with the song, "Steadfast Love," thank the Lord for his unwavering faithfulness to you. Ask God for the grace to respond to His unfailing love with as much love as you can muster. May you also be blessed with the ability to love God through the least, the last, and the lost in our society. May God bless you with a greater capacity to respond to his love by loving yourself and those whom He calls you to love. Have a steadfast and loving Thursday! Like us on Facebook if you wish to receive our posts. Today we are sharing, "Save us, Savior of the world', one of the three memorial acclamations for the New Roman Missal written by Tinnah dela Rosa. 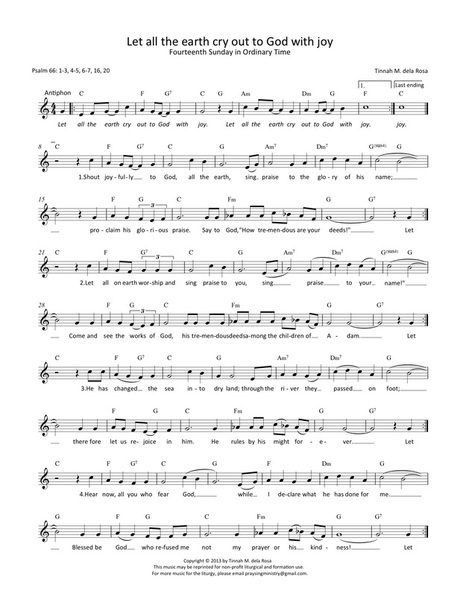 This song uses a joyful and lively tune especially composed for the Revised Roman Missal. 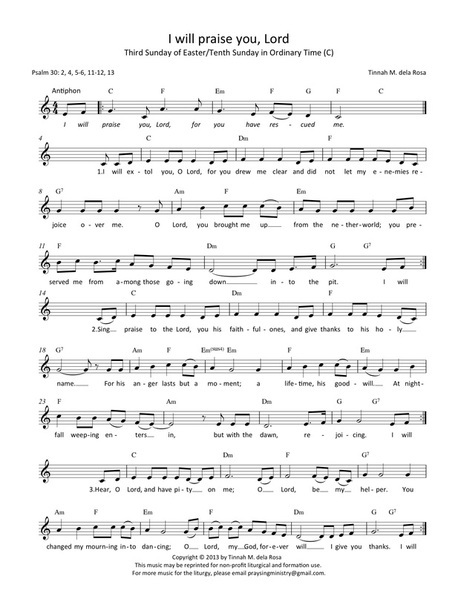 The psalm setting for next Sunday is an original composition by Tinnah M. dela Rosa for PraySing Ministry. This is also the same psalm as the 3rd Sunday of Easter. Click here to view the readings for next Sunday (June 9, 2013) via the US Conference for Catholic Bishops website.